We open at 4pm Tuesday through Sunday. We are closed on Mondays. 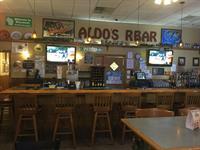 Welcome to Aldo’s “R”-Bar – Pizza and Catering. Our name says it all. We open at 4:00 PM on Tuesday through Sunday. We are closed on Mondays. We offer a full-service bar open til 2:00 AM every day. Join us for happy-hour each weekday; or, come in anytime and take advantage of some great drink specials. We offer pizza and much more. Our pizzas are homemade with only fresh toppings on crusts that we make daily. If you’re interested in a pasta dish, try one of our entrees including our signature dish “Lasagna”. If you want a lighter fare, we offer a variety of sandwiches, wraps and burgers. If you’re looking for a great fish fry, don’t miss ours on Fridays. As our name states, we also provide catering for your next event whether it be a birthday party of 25 or a wedding dinner for 400. We have hall space available to accommodate your event. If you prefer to cater your own party, we have an assortment of party pans and trays available for you to pick up at the restaurant. We can also deliver them to your home. We look forward to you being our guest at the restaurant and enjoy great food and drink. Your satisfaction is our number one goal. See our menu and catering pages for the complete selection.